Posted in MapleStory M. Updated on April 16, 2019 by Ayumilove. Collect 350 Maple Leaves Daily: You gain free Mysterious Pouch Bags that rewards few 100K meso. Complete Daily Missions: Completing all missions will reward a total of 120K meso. Mini Dungeon: You can farm approximately 150~200K meso for 30 minutes at Level 100. Elite Dungeon: Grind till Level 95+, and perform daily Elite Dungeon. It will guarantee to reward an Epic equpiment. You can sell them for 400~500K meso in the trading section. 2H Sword 26 220 650 1316 ~ ? 2278 ~ 2853 3769 ~ ? 2H Axe 26 219 650 1294 ~ 1475 2015 ~ ? ? ~ ? Dual Bowguns 28 221 651 1311 ~ 1688 2242 ~ ? 3168 ~ ? Staff 30 225 658 1328 ~ 1677 2298 ~ 2780 3744 ~ ? Knuckle 29 225 660 1333 ~ 1696 2307 ~ 2943 3790 ~ ? Utgard EXP inc % 0 0.2% 0.6% 1.3% 2.2% ? If you have found a value which is higher than the one posted here, kindly post a comment below mentioning the stat including an in-game screenshot as verification. Then I’ll update the table with the latest highest stat. Thanks! Mythic ? 1686 ? ? Mythic ? 1714 ? 981 ~ ? Mythic ? 1784 ~ 2160 990 ~ ? ? Mythic ? ~ 926 1629 ~ 2274 1042 ? Mythic ? ? ? ? Eclectic set effect is MaxHP, Physical Defense and Magical/Physical Attack. Hat Boss ATK inc % 0 0.2% 0.4% ? ? Chest Crit ATK 5 15 31 ? ? Gloves Crit ATK 8 25 50 ? ? Shoes Crit ATK 5 15 31 ? ? Muspell set effect is MaxHP, Evade and Magic Defense. Hat Crit DMG % 0.3% 0.9% 2% ? ? Chest MP Recovery inc 0 0 1 ? ? Gloves ACC 56 169 339 ? ? Shoes HP Recovery Inc ? ? 4 ? ? Grand or Vepar or Halphas set effect is MaxHP, Magic Defense and Physical Defense. Hat Crit ATK 5 15 31 ? ? Chest EVD 18 54 108 ? ? Gloves Crit DMG % 0.3% 0.9% 1.9% ? ? Shoes EVD 45 135 271 ? ? Pensalir set effect is MaxHP, Accuracy and Critical Attack. Hat EXP inc % 0 0.1% 0.2% 0.5% ? Chest EXP inc % 0 0.1% 0.2% 0.5% ? Gloves EXP inc % 0 0.1% 0.2% 0.7% ? Shoes EXP inc % 0 0.1% 0.2% 0.5% ? Although not part of the item sets, accessories also provide bonuses that are specific to that exact type of equipment. Noble Crit ATK 7 23 47 ? ? Challenger HP Recovery Inc 0 4 9 17 ? Royal MP Recovery Inc 0 0 1 1 ? Knight EXP Inc % 0 0 0.1% 0.3% ? Sirius Crit Rate % 0 0.1% 0.3% ? ? Bloody EVD 27 81 162 271 ? Explorer”s EXP Inc % 0 0.1% 0.2% ? ? Pensalir Meso drop Inc % 0.1% 0.4% 0.9% 1.5% ? Blue Gilded Crit Rate % 0 0.1% 0.3% 0.5% ? Rising Sun ACC 56 169 339 836 ? Extreme EXP Inc % 0 0 0.1% 0.3% ? Green Buckle Drop rate Inc % 0.1% 0.4% 0.9% 1.5% ? You can complete quests more easily by changing the Mini Dungeon settings to the monster of your current quest. Items at the Gold Leaf shop can be purchased using Gold Leaves. Tap the Shop icon at the top to enter the Gold Leaf Shop. Epic DualBowgun atk 662 not 651. @Anon: Thanks for the update! The Magician Mythic Outfit (1784 DEF) and Common Shoulder Mythic Emblem (1326 DEF) has been added into the list above. @all: The following items have been added into the list! Hi Ayumi, there is new pba for legendar emblem spear. @Exson: Thanks for sharing your Legendary Polearm. @LividExodus: Thanks for sharing your Rare Polearm. @LULgar: Thanks for sharing the Legendary Dagger. MOM !! my mythic emblemed claw is on ayumilove !! i fused my normal dagger which has 29 base attack into a rare and now its at 184? did i mess up? @iokain: Thanks for providing the screenshots for the Mythic Wand Emblem and Legendary Wand Emblem! I have updated the guide above with your pictures. landed an emblem scroll on pba legendary wand. Real Max is 2987. TY for keeping track! @JY: Thanks! I have updated Mythic Wand Emblem from 4716 to 4839. @iokain: Thanks! I have updated Mythic Bow from 3788 to 3849. I have emblem mystic wand with 4839 magic attack. @yexiang: Thanks! I have updated Rare Dagger from 218 to 222. @xRapha: Thanks. I have updated Legendary Staff PBA from 2249 to 2298. Your legendary staff pba listing is wrong. Here’s link to mine on my 146 blaze wiz on NA-Scania. @AranDex: Could you take a screenshot of the Polearm 219 and upload to https://imgbb.com/ and post the link here? So I can share the image here too. @Iceburnz: Thanks for the screenshot! I have updated Poloearm Rare (212 → 215 ATK). @travie: Thanks for the screenshot! I have updated Poloearm Epic (641 → 650 ATK). @manzou: Thanks for the screenshot! I have added Archer Outfit Mythic (New → 1714 DEF). I found a rare polearm with base 215. Here’s the screenshot for the polearm. @RedEquinoX: Thanks for the screenshot! I have updated Archer Hat Unique (220 → 228 DEF) and Archer Hat Unique Emblem (283 → 284 DEF). @InstallDream: Thanks for the screenshot! I hae updated Thief Glove Unique Emblem (427 → 430 DEF). Any idea what the stats for polearms are? I rank up a normal muspell magician glove perfect base (12 phy def and 12 mag def) but the new stats on the rare muspell gloves are 57 phy def and 57 mag def. Any insight on this? According to this page, shouldn’t I be getting 58 def gloves after rank up? @ZenShima: The image provided is Legendary Cape with highest defense 232. The guide above shows 257 DEF. @pisces: Could you kindly provide a screenshot of the unique mage hat non-emblem 235 DEF? I have a higher base gun with emblem. @Eric: What you see in the table is the number for the highest base attack for non-emblem and emblem weapon. I’m not understanding the Mythic PBA. Why is there a range for PBA? Shouldn’t there be one number for a perfect base? Hi what’s the pba for mythic claw? Screenshot doesn’t tally with numbers. And anyway what’s the mythic claw att range? @Veterans: The screenshot did not capture the max attack of the staff. Could you try scrolling a little higher to reveal the magic attack of the staff and retaking the screenshot? Why did my legendary staff go from 2406 to 1946? Why my mythic claw only 3183 base dmg? @Enzojjneo: Please share a picture of the emblem mythic bow 4771 ATK. Thanks! Got a bloody unique spear wa 1284. @YXPCBM: Thanks for the correction! I have swapped the stats between the Drop Rate Increase and Knockback Resistance. Link below in my previous post. @Maxwell: It disregards the brand as its based on the ranking of the item (e.g. Normal, Rare, Epic, Unique, Legendary, Mythic). That may be the reason why the CP (Combat Power) dips/drops whenever there is a big MapleStory M patch that may be caused by equipment base stats changed. Not sure if it matters, but they were all Bloody. @Nina: Could you please upload the image at https://imgur.com/upload so I can add it into the guide above? Thanks in advance. Hi I have a legendary staff with the base attack of 2222. @QuietLeaf: Thanks for the Knuckle Unique Emblem (1475 ATK). I have added it into the guide. @Jeffrey Min: Thanks for the Unique Staff (1328 ATK). I have updated the guide above. i believe warrior armor outfit max base status for normal is not 26. cause when i rank it up to rare i only get 102 and not 105. @Ayumilove I have a max level 650 base attack epic Jaihin spear, but the unrank option shows that the attack after upranking will only be 1255. Is this a bug? How do I send u the screenshots? @Ayumilove: I have another account which is using mage and bought 3 MAG ATK 30 perfect base staff and still I can only get 206 if I were to rank up. @JiaoRen: I think it maybe the case in which Darya’s comment mentioned about MapleStory M Dev remove Normal Spear (27 ATK) to nerf the damage of Dark Knight rather than changing the damage output formula for that job. @Kami: Thanks for the image! I have updated Rare Staff stats (223 → 225 ATK) in the guide above. Hi Ayumi. The PBA rare staff should be 225 instead of 223. @Ayumilove: It seems that it is no longer able to get full stat when doing a rank up even with a perfect base attack weapon. I have tried buying 5 perfect base attack spear and when I select them for the rank up, the attack is only going to be 202 instead of 220. Same as DT situation. I ranked up my 2H sword from Normal 26 but it became 216 instead of 220 as stated. @shin: The 2H Sword (220 ATK) has been added into the guide. @DixonTe and @Chew: MapleStory M armor’s Perfect Base Defense does not seem to increase to its fullest stat compared to weapon’s Perfect Base Attack based from my observations on the number of players mentioning about it on MapleStory M Official Facebook page and here as well. It’s highly recommended to prioritize on ranking up your Perfect Base Attack weapon or ranking up Emblem weapon with Maple Leaf before moving to armors. There is a MapleStory M player who have experimented that the difference between a 50 DEF and 500 DEF only reduces the monster’s inflicted damage from 260 to 240. @AstXvr: Thanks for the 2 images. I have added Mythic Emblem Gun (4712 ATK) and Mythic Claw Emblem (4924 ATK) into the guide above. Hi Ayumi. I just find it strange that my Def 24 normal thief outfit (should be the max norm) when upgrade, it will be 95 instead of 102. Is it that leveling up on max stats does not confirm will be max stats of next grade? @AstXvr: Thanks for the Claw Mythic Emblem (4864 ATK). I have added into the guide above! What happened to ranking up PBA weapons?! They’re not perfect anymore!!! Ayumi, your information is incorrect. Please rework your weapon stat section. Please also check on other section such as armour. Why now when i rank up weapon using rank up stone Perfect stat 225 for claw should be 660 right? And for epic to unique is 1333? But now only 1265? What happen to perfect stat? Knuckle Basic ATK Epic 660.
knuckle pba should be the same as claw. ive got an epic knuckle with 660 pba after ranking up a perfect rare. I have a unique 2H with 1315 base atk, I can provide screenshot if needed. Max attack for an epic staff is 658. I have a jaihin staff for BW with a Mag atk at 652 base. Is this the PBA? The chart lists 651 right now. Hi I bought a 2h sword normal 26 atk and after i upgrade it to Rare it is only 216 atk instead of 219. is there a 27 atk sword? umm my base atk for mythic wand is 3787.. so how is 3695 PBA? Hi ayumi, highest epic knuckle i saw was 660. Seems like there’s no PBA anymore, after the patch. @all: I have added a new section which consists of Two-Handed Sword, Staff and Knuckle weapons, which is just below the existing weapons (e.g. Spear, Bow, Wand, Claw, Gun). @Lapi: Thanks for the Mythic Cape (345 DEF). I have added into the guide above! @Jason: Thanks for the Mythic Spear (3780 ATK). I have added into the guide above! @Roy: Thanks for the Mythic Gun (3849 ATK). I have added into the guide above! This wld be of much help to me if someone can confirm it. Thanks! PBA Mythic Gun I made before they changed the upgrading. Hope it helps. @Darren: Could you please provide a screenshot of the Jaihin Unique Emblem Claw so I can add it to the guide above? I mean for a claw, I got a 1705 for a claw. @Darre Lee: Currently the highest stat for Unique Spear is 1706 ATK. Hi i got a emblem jaihin that is 1705, not sure if its the max for now! @darkeye471: Thanks for the Cape Unique Emblem (140 DEF)! I have added into the guide above. @merkykrem: Thanks for the Legendary Emblem Wand (2956 ATK). I have updated the guide above. @Christian: Thanks for the Legendary Emblem Archer Outfit (1199 DEF)! I have added into the guide above. finally upgraded some warrior boots from Normal to Unique. @Yao: You will get a random weapon attack value and even a different type of weapon (e.g. Jaihin -> Utgard) if you use fusing regardless of using 2 max weapons. If you want to retain the perfect base attack, use Rank Up Stone to rank up your weapon. This also applies to emblem. If you rank up an emblem unique, it will be an emblem legendary. Currently the top players are now focussing on getting an emblem rather than PBA/PBD (Perfect Base Attack or Perfect Base Defense), they are spending millions of meso to combine multiple epic equipment to get an emblem unique equipment which has higher base stat by 300~500. Then they start ranking up the emblem unique to emblem legendary. Take note that the chances of getting emblem equipment is quite low. If I fuse a max wa weapon will it be still max wa at its next tier or must I rank up instead of fuse? @Darya: Thanks for the screenshots. The following images have been updated. @Maxwell: Some mentioned there was a 102 DEF Thief Rare Outfit but no screenshot to proof it. Therefore, I only add an approximation of the highest base defense which is 102 as reference. @Art: Probably due to the calculation performed on MapleStory M game engine that decided that it does not round up but round down. I believe MapleStory M game developers need to look into this issue and fix it so the values will be consistent upon ranking up with Rank Up Stone on a Perfect Base Attack weapon and Perfect Base Defense armors. There was a Spear with 27 Weapon Attack when the game first launched but after for some game patches, the 27 Weapon Attack spear seems to be not obtainable. During my auto-battle session, I received approximately more than 10 Rare Spears with 26 Weapon Attack and not a 27 Weapon Attack. I upgraded my spear at max epic (650) to unique and it came out as 1315 instead of 1316 that’s on your chart. Is your chart wrong or did I just strike bad luck? Can u provide a table which include how many full epic item (lvl15) for a unique item to legendary ? Hi Ayumi, I have verified that using a normal PBA claw does carry the PBA to the next rank and so forth as long as you don’t fuse. I realized my mistake when I thought a normal spear of 26 atk is the PBA, which caused me mesos and powder to rank it before realizing this fact. Hence can confirm 27 is the PBA for normal spear. @Chew: You can star enhancing your weapon and your armor once you are ready to train in Star Force maps, preferablly recommended level to train is starting it at Level 100 and use 4th Job Skill to train as the monsters are pretty tough. If you have a fully upgraded Unique weapon or Legendary weapon, you can solo train at Star Force maps much earlier without needing to join any party. @JUTJUT2Night: Thanks for the image of Legendary Spear (2279 ATK). I have added into the guide above. Hi, can anyone confirm if magician unique rank outfit is perfect at 553? Does it worth a lot if both types of defence is 553? It is the eclectic type though. May i ask after i rank up my max stat weapon to Epic, i start to enhance my weapon is it correct? If i fully level up my max stat weapon Epic which enhance to few stars, i want to rank up my Epic to Unique, stars will lost or reduce? @Kotaru: Please provide a picture of the item in the inventory. The base stat shown at the upgrade window will not match with the one in the inventory. @Max: Please provide a picture so we can confirm whether the Rare Spear is 643 ATK. @Lw: Please provide a picture of the Epic Thief Shoes (334 DEF). Thanks! its so weird, normal spear max only 26 from what i check in market. but i looted 643wa rare spear, which way higher compare to rank up from normal 26WA. @Edwin: Please provide a picture of the epic pirate shoe (168 DEF). Thanks! Pirate epic shoes. Just loot a shoe with 168 base stats. @Travie: I have tested on rare and normal rank weapons and ranked them up to Epic, the perfect base attack stats will be carried forward. This was tested last month though. @Chibiharu: Could you kindly provide the image when you are equipping it or view it in the inventory? The base attack will be different when its viewed in the inventory. @Max: Thanks for the suggestion on the Jewel set. I have added into the guide above! @Chibiharu: Thanks for the Mythic Wand (3695 ATK). I have added into the guide above! I fused a mythic wand that has 3695 dmg. I think that is pretty close to max stat. @Bonkers: Thanks for the Mythic Spear (3587 ATK) and Legendary Spear (2278 ATK). I have added into the guide above! TQ, ur notes are nearly complete. if u can add in jewel set bonus over here, it will be perfect. i got the link for jewel set bonus. putting the Unique spear 1316 into http://imageedited.com/ says it’s probably edited, I ranked up a spear from 220 and it is 1315 attack. @Icemeh: Please provide a screenshot of the max legend spear 2278 ATK. Thanks! @Azurie: Thanks for the Epic Belt (166 DEF). I have added into the guide above! Got a 166 epic belt here, thanks for the list! Quick question. Do you lose your enhancements when you rank up? Understand that the best course is to level up > rank up > enhance. So I am trying to rank up my perfect max base stat weapon but I’m having difficulty getting gold leaves to buy the epic weapon rank up stone (to get the unique weapon and enhance from there). Is there any other way to get gold leaves besides the daily quests or another way to get the rank up stones? @all: Added a Unique Spear PBA (1316 ATK) from Trade Station. @hoho: Thanks for the Rare 65 warrior glove and Epic 171 warrior glove. I have added into the guide above! @Anders: I think this can only be answered by MapleStoryM Nexon developers as they design the armor stat increment by ranking-up/fusing. We can guess that it’s using some sort of RnG (Random Number Generator) to generate those values or assumed its due to some kind of rounding-up/rounding-down the values like the Spear ATK 26 (it could probably be 26.5 that is rounded up to 27). 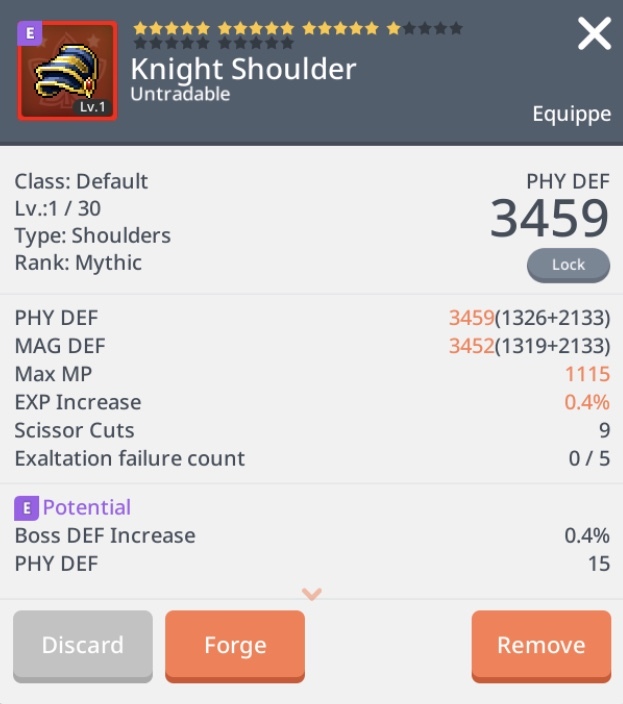 @Melly: Thanks for the Mythic Claw (3683 ATK). I have added into the guide above. I have a perfect 12 normal Magician Eclectic gloves but I only got 57/57 when I did a rank up to rare. I then purchased a perfect 58/58 rare Magician Eclectic gloves but when i go to the rank up page, it shows it will only get 161/161 if i were to rank it up. Why is it so? @Baoberz: Thanks for the Legendary Claw (2307 ATK). I have added into the guide above. Hey Ayumi, should I leave my ss in the comments or email you? @Melly: Thanks for the Spear Unique (1315 ATK) screenshot! I have added into the guide above. @Gat: Thanks for the Warrior Shoes Rare (65 DEF) and Warrior Shoes Epic (171 DEF) screenshot! I have added into the guide above. @Marc: Thanks for the Magician Hat Epic stat 112 DEF screenshot! I have added into the guide above. Did you use “Rank Up”? If you use “Fuse” the stats wil be randomly rerolled. Also can anyone tell me why 12-12 eclectic warrior hat upgrades to 42 stats not 43 even tho i can see a 43 stat in market? Hi I had a perfect 24/24 thief overall and it’s on epic now total is 273/273 is my overall not perfect ? Also my shoe as well it was 15/15 now it’s on epic only 161/161 did I do something wrong during ranking? @maybemyresponseneversentbcididntputanemail aka! : I found an Archer Epic shoes from Trade Station that has a base stat of 163 DEF. So I don’t think it would apply to archer unless there is a screenshot that says otherwise. Hi, does the perfect base attack weapon can only be achieved by rank up(using stones) and not fusing two perfect max base attack weapons? @Skills: Thanks for the Wand Unique stat 1328 ATK screenshot! I have added into the guide above. @TwitchTV_SnappyKevin: Thanks for the Spear Legendary stat 2480 ATK screenshot! I have added into the guide above. @Dean: I currently couldn’t advise since I did not seen 1 in person with any screenshots to proof it. @Eiei: Thanks for the Wand Unique Emblem stat 1626 ATK screenshot! I have added into the guide above. @Raphael: Thanks for the Bow Unique perfect stat 1338 ATK screenshot! I have added into the guide above. @darkeye471: Thanks for the Gun Unique perfect stat 1338 ATK screenshot! I have added into the guide above. You can use 5 jewels of the same rank and colour to make a JEWEL SET. Can anyone answer whether or not an unique emblem item can be ranked up (using stones) to get a legendary emblem item? couldn’t manage to find any answers for this on the net. sorry for the dumb question if anyone is offended. Update on Legendary PBA Spear Stat. Here is a screen shot proof for your bow of 1338 Unique stats. This is my own bow that i ranked up. @lynn: Magic Attack +100 (value) is much better than Magic Damage Increase +1% if your base attack is low. If your base attack is high, then go with Magic Damage Increase. Personally, I’ll go with Magic Attack since its will contribute more damage early on in the game. @Nicklaus Oh: Thanks for the screenshot for the Warrior Outfit Epic 280. I have replace the one in the guide with your image and stats. First value (1315) refers to highest seen stat with proof/screenshot. Second value (1338x) refers to the perfect max stat without any proof/screenshot. There are some players who perform upgrade on their perfect max stat armor mentioned that its based on RnG (Random Number Generated). and amour which is max stats rank up give max stats or random ? I found a legit Warrior Outfit at 280, I have screenshot proof..
magic attack +100 is better or magic dmg increase +1% is better? thanks! magic attack +100 is better or magic dmg increase +% is better? thanks! @all: Added some images of the Emblem armor equipments. @Dennis: There are some MapleStoryM players that after they max upgraded their normal armor and ranked it up, some will reach its max defense stats. I guess its something to do with the MapleStoryM game engine logic which may use some RNG (Random Number Generator) to introduce slight variation to the armor stat. Currently Trade Station has not listed any warrior normal hat above 12 defense stat. This same applies to warrior normal outfit above 26 defense stat. @Mystery: Thanks for the image link! I have added the stat and image link into the guide above. @Quynn: Please provide a screenshot in-game of the Archer Epic Hat 112 so I can add it in the guide above. Thanks! Max for Archer epic hat is 112, not 108. @Kyoru: Some forum members mentioned that armor gears may be slightly random. @Samuel: Currently the Trade Station has out of stock for Spear ATK 27. You can try purchasing a Spear ranked at Rare or Epic at max stat. Upgraded my 24/24 Halphas, Rank Up gives 101 instead of 102 D: Where did i go wrong? Hi Ayumi, So far I only have WA 26 Spears all the time, and havent seen a 27 yet. Hi Ayumi. Bought warrior normal hat 12 and normal outfit 26. Level it up, but hat came out to be 110 epic and outfit 102 rare. Don’t think normal hat 12 and normal outfit 26 is the max. @Mike: Thanks for the notice. I have updated the Epic Spear Stats to 1315. The spear ATK value 1316 was obtained from the video spreadsheet. Hi ayumi, my friend ranked up his spear from epic to unique, 650 att, however the end state is only capped at 1315. Does 1316 att unique spear exist? So far in the market only found 1315. There isn’t any image or video to clarify also. Hopefully you have some inner info! Hi, i wanna know what is the difference between Crit ATK stat and Crit Dmg % stat. how does it work and which is better? Hi max stast Defense : Shoulder Cape and Belt ?……..
Hi admin! If i not mistaken Mythic weapon can only be obtained using fusion of legendary. So, what’s the point of getting perfect base damage weapon if we need to fuse it in the end? Hope you can reply me on this, THanks you! i upgraded my Archer Shoes from max base 12 and this is the value i got thereafter (Rare 57) and (Epic 159). any idea? Grand Vapair Boots, Rare(61), after upgrade, Epic(160). Briser Gun, Normal(29), Rare(225), Epic(662) and then wala! Unique(1294)! I’ve seen others with this exact figure as well… Any idea why?! Gun, i got 225 base attack for rare grade. Should we buy max base stats for armour or sets or just for the weapon will do?and do not care much about the max base stats for armour and sets. Max Base Stat for Gun is 28.